For the past few years, shades of white, pink, and gray have led interior color trends. But the use of bolder colors is on the rise, and vibrant hues of green are becoming a popular choice. With spring and summer just around the corner, it’s the perfect season to incorporate Mother Nature’s favorite color into your home décor. The color “Greenery” was Pantone’s 2017 color of the year, which helps indicate that there is certainly nothing fleeting about the color. Green has a timeless place in interior decorating – it’s hard to find a period when it wasn’t at least used as a backdrop or with room accent pieces. The current décor trend sees a variety of green hues taking center stage. Green can provoke a lot of things – luxuriousness, serenity, calm, or an earthy aesthetic. If used correctly, a rich emerald green adds a luxurious vibe to your décor, a calming pale green can be reminiscent of a relaxing spa, or a fern colored green will add a touch of festive spring to your interior. Whether you are ready to go for the bold or incorporate green into your space in a subtle way, decorating with shades of green is a continuing trend. Green is a perennial favorite of interior designers for its ability to bring balance to a space. According to the psychology of colors, green creates a sense of calm and relaxation. Being outdoors brings many people a sense of harmony and tranquility – maybe part of that is the many nuances of green in nature. Why Is Green Important In Interior Design? Many decorators use green in their designs because it is a soothing hue and easy on the human eye. Even during the stark months of winter, nature has a display of evergreens to tide us over until the brilliant bursts of spring color arrive. We can take a hint from nature and use green year-round to make a room feel both peaceful and vibrant at the same time. Green is one of the most natural colors to incorporate into a room. Consider a few of the tips below to get your creative side thinking about how you can use the color in your home. If you have stark white walls, purchase one signature piece of furniture in a green hue, perhaps an entryway bench or a tall dresser for your bedroom. Whether you choose a calming seafoam green or a vibrant green apple color, the green itself will enliven your space. 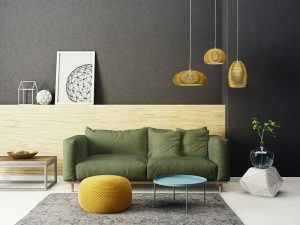 It’s an effortless way to try out the shade, but be forewarned, you may find yourself drawn to the timeless simplicity of decorating with green and want to add it to every room of your home. Try painting a singular door in a green hue – maybe the door to your main level bathroom so you can direct your guests to “the green door.” After all, if you decide you don’t like the color, paint is relatively inexpensive and can easily be redone. But chances are the green door will suit you just fine. If you are fortunate enough to have built-ins in your home, try painting them a pale mint green shade. It will make the room feel welcoming and larger. The green backdrop will also draw interest to the items you choose to display – and your treasures will add a vibrant “pop” to the color green. Another fun way to incorporate green is to use a garden theme in your bathroom. You can mix several shades of green into the scheme – walls one shade, towels and rugs another shade – then add a few small, live plants. Top it off with a garden print and you will have one uniquely green bathroom. Experiment with textiles. Try using botanical print curtains, bedding, or accent pillows to bring a bit of nature indoors – a fern pattern is timeless and goes well with nearly everything. To complete the look, bring a fern plant into the same room with the botanical textiles to add a layer of texture. Whatever your decorating style, designers at The Guest Room are here to help if you have questions or are looking for just the right accessory, print, or textile to make your space into the home you envision. Call us today or stop by our showroom for more details. Sign-up to recieve emails announcing news, sales events, and special offers.